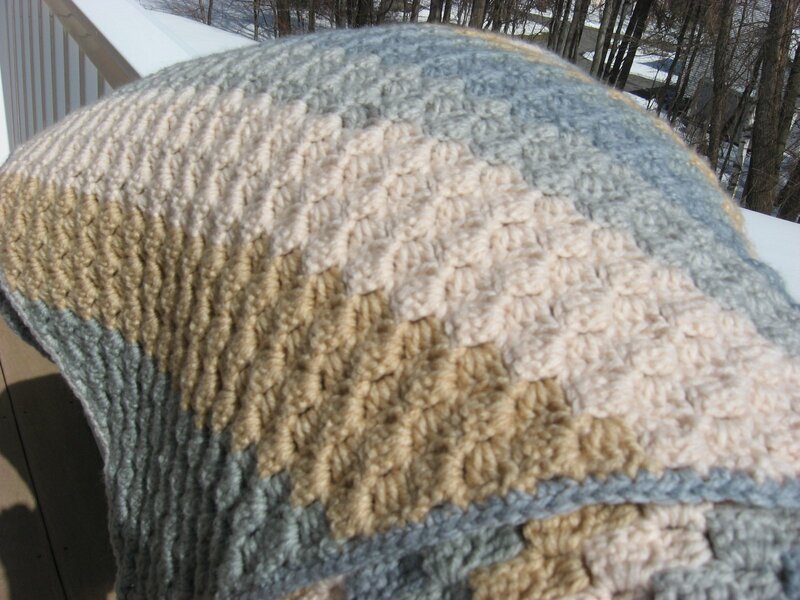 Hooked on Needles: Crocheted C2C Wedding Gift Afghan ~ It's HUGE! Have you crocheted anything using the corner-to-corner design yet? It's been a favorite of mine for some time now, and it's the stitch I used for this very large wedding gift afghan. What I like about corner-to-corner, or c2c as it is commonly called, is that it starts small and fast, increasing by one 3-double-crochet cluster on each row. 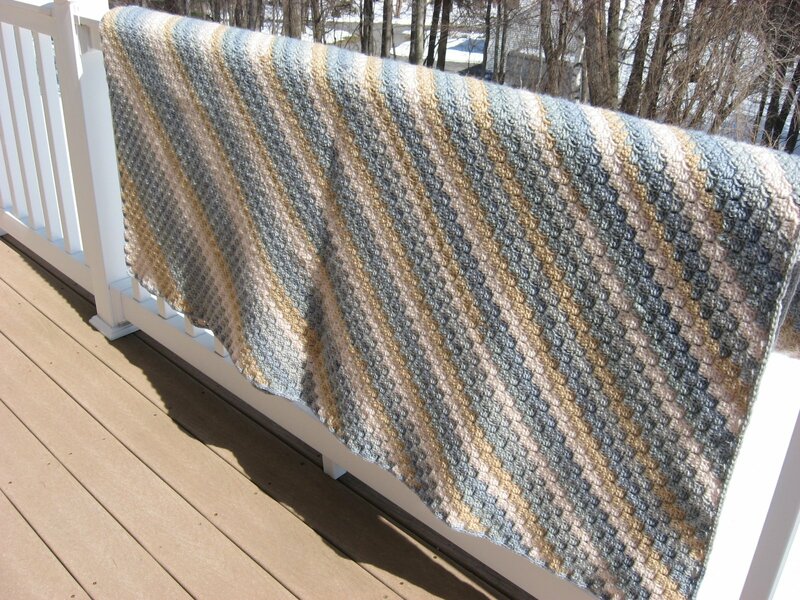 This technique allows you to determine the width of the project when you have crocheted to that point, instead of at the start of the project with the beginning chain. I find it so much easier to lay the project out on the floor or on a bed or couch or whatever I might be making the project to fit, and then I can see if it is as wide as I want it to be. If it is, then I start decreasing on one side. 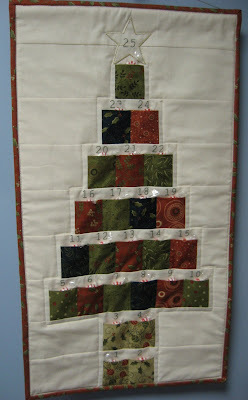 If it is not, then I continue increasing on each row until it is a little wider, then lay it out again. For this project, I used Bernat POP worsted weight yarn in the colorway called Foggy Notion. This is a very long color changing yarn which produces stripes of colors without having to change yarns. 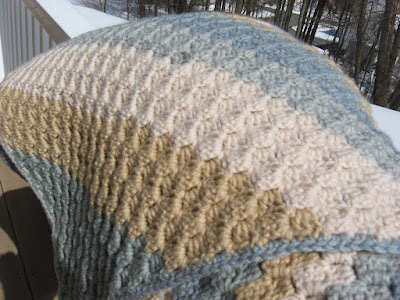 The c2c design makes the stripes come out as diagonal, giving a little more interest to the finished piece. 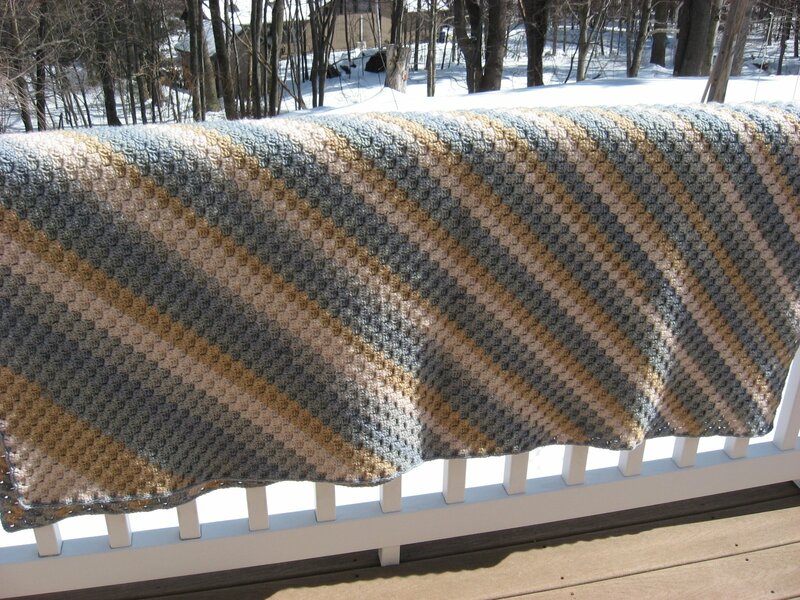 This afghan ended up measuring approximately 6 feet wide by almost 8 feet long and used just about 17 balls of the Bernat POP yarn which are 5 ounces each, which makes the afghan weigh in at almost five and a half pounds! Once I finished the main rectangle of the afghan in the c2c stitch design, I added one round of single crochet as a simple border. As it turned out, the entire round of single crochet ended up being worked in the darker colors and I thought that finished it off nicely. 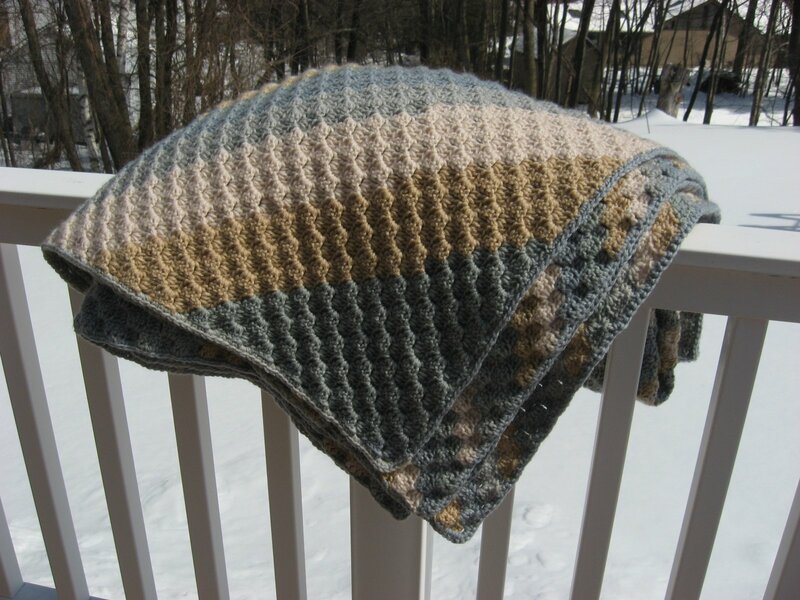 For some c2c afghans, like the one pictured HERE, I will add many rounds of single crochet if a little extra width is needed. This afghan did not need any extra width! One of my coworkers is getting married in June so this will be her gift from me. I am glad to have it all finished and wrapped up well in advance of the date so I don't have to be crocheting under pressure. I have started another crochet project already, and this one has a cute story behind it. I'll share it soon, with some pictures of my progress. Beautiful afghan! 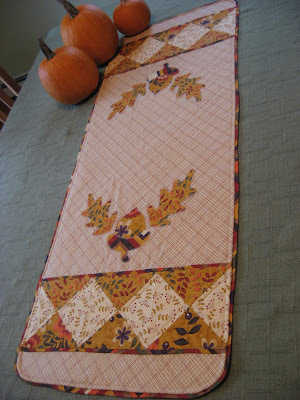 I love the colors - must try a corner to corner project - you are tempting me to try something new!! What a wonderful wedding gift! I love the soft colours. The lucky couple will cherish this for the rest of their life. PS: Discovered your blog today, it's lovely!